Contouring a part means creating a fine finish on an irregular or uneven surface. Dissimilar to finishing a flat or even part, contouring involves the finishing of a rounded, curved, or otherwise uniquely shaped part. 5-axis machines are particularly suitable for contouring applications. Because contouring involves the finishing of an intricate or unique part, the multiple axes of movement in play with 5-axis Machining allow for the tool to access tough-to-reach areas, as well as follow intricate tool paths. Advanced CAM software can now write the G-Code (the step-by-step program needed to create a finished part) for a machinists application, which has drastically simplified contouring applications. Simply, rather than spend several hours writing the code for an application, the software now handles this step. Despite these advances, most young machinists are still required to write their own G-Codes early on in their careers to gain valuable familiarity with the machines and their abilities. CAM software, for many, is a luxury earned with time. 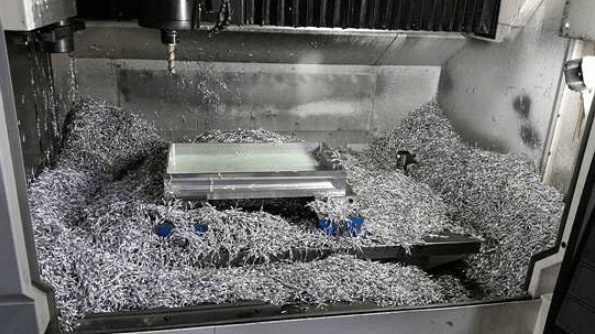 Because contouring requires very specific tooling movements and rapidly changing cutting parameters, ridding machinists of the burden of writing their own complex code can save valuable prep time and reduce machining downtime. Generated G-Codes can cut several minutes off of a cycle time by removing redundancies within the application. Rather than contouring an area of the part that does not require it, or has been machined already, the CAM Software locates the very specific areas that require machining time and attention to maximize efficiency. CAM Programs that are packaged with CAD Software such as SolidWorks are typically the best in terms of consistency and ability to handle complex designs. While the CAD Software helps a machinist generate the part, the CAM Program tells a machine how to make it. Prior to running a contouring operation, an initial roughing cut is taken to remove material in steps on the Z-axis so to leave a limited amount of material for the final contouring pass. In this step, it’s pivotal to leave the right amount of material for contouring — too much material for the contouring pass can result in poor surface finish or a damaged part or tool, while too little material can lead to prolonged cycle time, decreased productivity and a sub par end result. The contouring application should remove from .010″ to 25% of the tool’s cutter diameter. During contouring, it’s possible for the feeds to decrease while speeds increases, leading to a much smoother finish. It is also important to keep in mind that throughout the finishing cut, the amount of engagement between the tool’s cutting edge and the part will vary regularly – even within a single pass. Ideal tool selection for contouring operations begins by choosing the proper profile of the tool. A large radius or ball profile is very often used for this operation because it does not leave as much evidence of a tool path. Rather, they effectively smooth the material along the face of the part. Undercutting End Mills, also known as lollipop cutters, have spherical ball profiles that make them excellent choices for contouring applications. Harvey Tool’s 300° Reduced Shank Undercutting End Mill, for example, features a high flute count to benefit part finish for light cut depths, while maintaining the ability to reach tough areas of the front or back side of a part. While advanced CAM Software will create the G-Code for an application, saving a machinist valuable time and money, accuracy of this code is still vitally important to the overall outcome of the final product. Machinists must look for issues such as wrong tool call out, rapids that come too close to the material, or even offsets that need correcting. Failure to look G-Code over prior to beginning machining can result in catastrophic machine failure and hundreds of thousands of dollars worth of damage. Inserting an M01 – or a notation to the machine in the G-Code to stop and await machinist approval before moving on to the next step – can help a machinist to ensure that everything is approved with a next phase of an operation, or if any redundancy is set to occur, prior to continuation. Contouring is most often used in 5-axis machines as a finishing operation for uniquely shaped or intricate parts. After an initial roughing pass, the contouring operation – done most often with Undercutting End Mills or Ball End Mills, removes anywhere from .010″ to 25% of the cutter diameter in material from the part to ensure proper part specifications are met and a fine finish is achieved. During contouring, cut only at recommended depths, ensure that G-Code is correct, and use tooling best suited for this operation. End mills feature many different dimensions that can be listed in a tool description. It is important to understand how each dimension can impact tool selection, and how even small choices can make all the difference when the tool is in motion. Flutes are the easiest part of the end mill to recognize. These are the deep spiraled grooves in the tool that allow for chip formation and evacuation. Simply put, flutes are the part of the anatomy that allows the end mill to cut on its edge. One consideration that must be made during tool selection is flute count, something we have previously covered in depth. Generally, the lower the flute count, the larger the flute valley – the empty space between cutting edges. This void affects tool strength, but also allows for larger chips with heavier depths of cut, ideal for soft or gummy materials like aluminum. When machining harder materials such as steel, tool strength becomes a larger factor, and higher flute counts are often utilized. The profile refers to the shape of the cutting end of the tool. It is typically one of three options: square, corner radius, and ball. Square profile tooling features flutes with sharp corners that are squared off at a 90° angle. This type of tooling features flutes with no flat bottom, rounded off at the end creating a “ball nose” at the tip of the tool. The cutter diameter is often the first thing machinists look for when choosing a tool for their job. This dimension refers to the diameter of the theoretical circle formed by the cutting edges as the tool rotates. The shank diameter is the width of the shank – the non-cutting end of the tool that is held by the tool holder. This measurement is important to note when choosing a tool to ensure that the shank is the correct size for the holder being used. Shank diameters require tight tolerances and concentricity in order to fit properly into any holder. Overall length is easy to decipher, as it is simply the measurement between the two axial ends of the tool. This differs from the length of cut (LOC), which is a measurement of the functional cutting depth in the axial direction and does not include other parts of the tool, such as its shank. An end mill’s overall reach, or length below shank (LBS), is a dimension that describes the necked length of reached tools. It is measured from the start of the necked portion to the bottom of the cutting end of the tool. The neck relief allows space for chip evacuation and prevents the shank from rubbing in deep-pocket milling applications. This is illustrated in the photo below of a tool with a reduced neck. 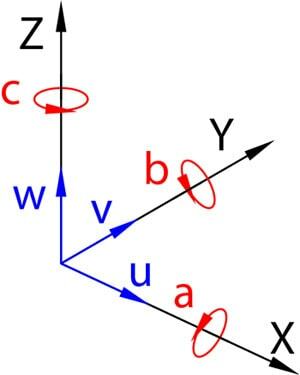 The helix angle of a tool is measured by the angle formed between the centerline of the tool and a straight line tangent along the cutting edge. A higher helix angle used for finishing (45°, for example) wraps around the tool faster and makes for a more aggressive cut. A lower helix angle (35°) wraps slower and would have a stronger cutting edge, optimized for the toughest roughing applications. A moderate helix angle of 40° would result in a tool able to perform basic roughing, slotting, and finishing operations with good results. Implementing a helix angle that varies slightly between flutes is a technique used to combat chatter in some high-performance tooling. A variable helix creates irregular timing between cuts, and can dampen reverberations that could otherwise lead to chatter. Pitch is the degree of radial separation between the cutting edges at a given point along the length of cut, most visible on the end of the end mill. Using a 4-flute tool with an even pitch as an example, each flute would be separated by 90°. Similar to a variable helix, variable pitch tools have non-constant flute spacing, which helps to break up harmonics and reduce chatter. The spacing can be minor but still able to achieve the desired effect. Using a 4-flute tool with variable pitch as an example, the flutes could be spaced at 90.5 degrees, 88.2 degrees, 90.3 degrees, and 91 degrees (totaling 360°). Chipbreaker End Mills feature unique notch profiles, creating a serrated cutting edge. These dividers break otherwise long, stringy chips into small, easily-managed swarf that can be cleanly evacuated from the part. But why is a chipbreaker necessary for some jobs, and not others? How does the geometry of this unique tool impact its proper running parameters? 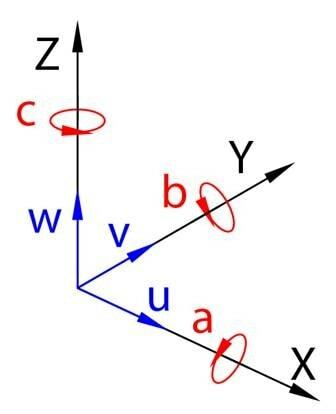 In this post, we’ll answer these questions and others to discover the very real benefits of this unique cutting geometry. As a tool rotates and its cutting edge impacts a workpiece, material is sheared off from a part, creating chips. When that cutting process is interrupted, as is the case with breaks in the cutting portion of the tool, chips become smaller in length and are thus easier to evacuate. Because the chipbreakers are offset flute-to-flute, a proper, flat surface finish is achieved as each flute cleans up any excess material left behind from previously passed flutes. When chips are removed from the part, they begin to pile in the machine. For extensive operations, where a great deal of material is hogged out, chip accumulation can very rapidly get in the way of the spindle or part. With larger chips, accumulation occurs much faster, leaving machinists to stop their machine regularly to remove the waste. As any machinist knows, a stopped machine equates to lost money. Inefficient chip evacuation can lead to chip recutting, or when the the tool impacts and cuts chips left behind during the machining process. This adds stresses on the tool and accelerates rate of wear on the cutting edge. Chipbreaker tooling creates small chips that are easily evacuated from a part, thus minimizing the risk of recutting. A Harvey Performance Company Application Engineer recently observed the power of a chipbreaker tool firsthand while visiting a customer’s shop in Minnesota. The customer was roughing a great amount of 4340 Steel. Running at the parameters below, the tool was able to run uninterrupted for two hours! Chipbreaker geometry is well suited for materials that leave a long chip. Materials that produce a powdery chip, such as graphite, should not be machined with a chipbreaker tool, as chip evacuation would not be a concern. Helical Solutions’ line of chipbreaker tooling includes a 3-flute option for aluminum and non-ferrous materials, and its reduced neck counterpart. Additionally, Helical offers a 4-flute rougher with chipbreaker geometry for high-temp alloys and titanium. Harvey Tool’s expansive product offering includes a composite cutting end mill with chipbreaker geometry. Chipbreaker geometry, or grooves within the cutting face of the tool, break down chips into small, manageable pieces during the machining process. 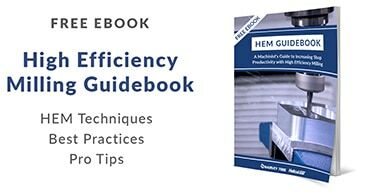 This geometry can boost shop efficiency by minimizing machine downtime to clear large chips from the machining center, improve tool life by minimizing cutting forces exerted on the tool during machining, and allow for more accelerated running parameters. Milling part features with thin wall characteristics, while also maintaining dimensional accuracy and straightness, can be difficult at best. Although multiple factors contribute, some key components are discussed below and can help to increase your thin wall milling accuracy. Long length tooling with a long length of cut can spell trouble in thin wall milling situations due to deflection, chatter and breakage. It is essential to keep your tool as strong as possible while maintaining the ability to reach to the desired depth. Necked-down tooling provides added tool strength while also helping you to reach greater than 3x Diameter depths. To support the thin wall during the machining process, keep a wide-cross section behind it. We recommend utilizing a “stepped down” approach, which divides the total wall height to manageable depths while working each side of the wall. 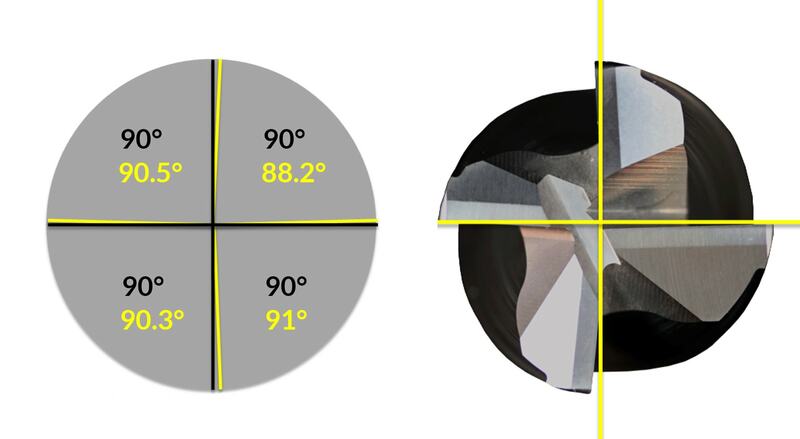 The Axial Depth of Cut (ADOC) dimension will vary depending on the material (and its hardness) being cut. A progressive Radial Depth Of Cut (RDOC) strategy is also important as the thin wall height is increasing. Reducing tool pressure while support stock is disappearing is equally important to keep the thin wall stable. Detail A represents a 5-step progressive radial approach. The number of passes will depend upon your particular application, material hardness and final wall dimensions. This approach helps to keep the pressure off the wall as you make your way towards it. Additionally, it is recommended to alternate sides when using this RDOC strategy. The final RDOC passes should be very light to keep wall vibration to a minimum while maximizing your part finish. Climb milling will help to keep tool pressure to a minimum. Manual vibration dampening and wall stabilization can be achieved by using thermoplastic compounds, or wax, which can be thermally removed. The use of ultra-high performance tool paths can optimize tool performance. Deep cavity milling is a common yet demanding milling operation. In this style, the tool has a large amount of overhang – or how far a cutting tool is sticking out from its tool holder. The most common challenges of deep cavity milling include tool deflection, chip evacuation, and tool reach. Excess overhang is the leading cause of tool deflection, due to a lack of rigidity. Besides immediate tool breakage and potential part scrapping, excessive overhang can compromise dimensional accuracy and prevent a desirable finish. Tool deflection causes wall taper to occur (Figure 1), resulting in unintended dimensions and, most likely, an unusable part. 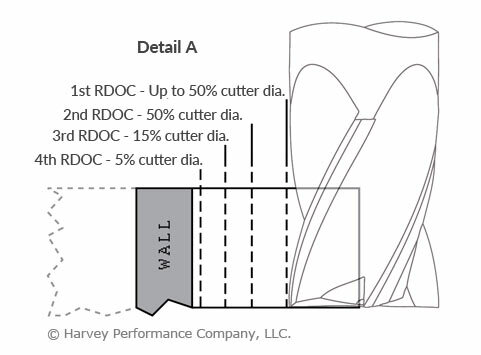 By using the largest possible diameter, necked tooling, and progressively stepping down with lighter Axial Depths Of Cut (ADOC), wall taper is greatly reduced (Figure 2). 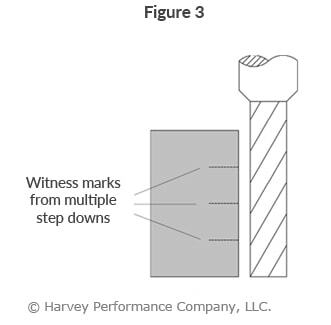 Although increasing your step-downs and decreasing your ADOC are ideal for roughing in deep cavities, this process oftentimes leaves witness marks at each step down. 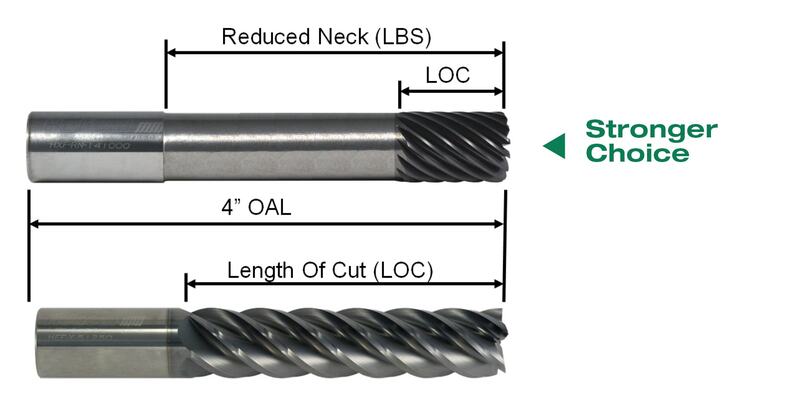 In order to achieve a quality finish, Long Reach, Long Flute Finishing End Mills (coupled with a light Radial Depth of Cut) are required (Figure 3). Avoiding tool deflection and achieving an acceptable finish are challenges that need to be acknowledged, but what if you can’t even reach your required depth? Inability to reach the required depth can be a result of the wrong tool holder or simply a problem of not having access to long enough tooling. Fortunately, your tool holder’s effective reach can be easily increased with Harvey Tool’s Extended Reach Tool Holder, which allows you to reach up to 6 inches deeper. 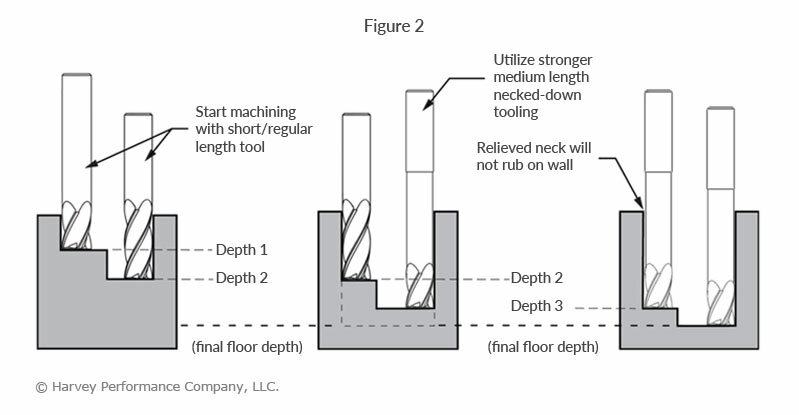 Many machining operations are challenged by chip evacuation, but none more so than Deep Cavity Milling. 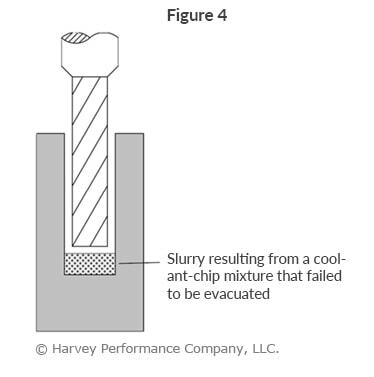 With a deep cavity, chips face more obstruction, making it more difficult to evacuate them. This frequently results in greater tool wear from chip cutting and halted production from clogged flute valleys.